AC/DC’s Rock Or Bust trek is among the highest grossing active live shows and has landed the band on Billboard’s Hot Tours chart. 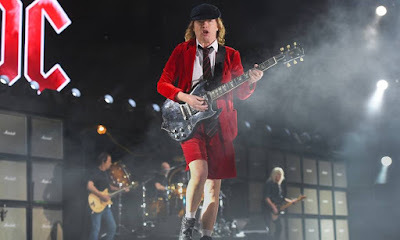 Billboard reports AC/DC appear at No. 3 on the "Hot Tours" list of top-grossing tours behind Nicki Minaj and Shania Twain with $4 million in ticket sales from a single outdoor performance at the Plaines d'Abraham in Quebec City on August 28. Promoted by Live Nation and Montreal-based event producer Evenko, the concert drew 48,588 fans. The Quebec performance is the first of three outdoor events staged in Canadian markets during AC/DC's current North American tour, which will wrap up at Dodger Stadium in Los Angeles on September 28. The band will play shows in Moncton, NB, Detroit, MI and Toronto, ON in the next week. The tour marks the return of guitarist Stevie Young and drummer Chris Slade to the lineup following the retirement of founder Malcolm Young and a series of legal issues faced by longtime member Phil Rudd.